June 16, 2016by Mark Leddenin InsightsDo adults actually change? 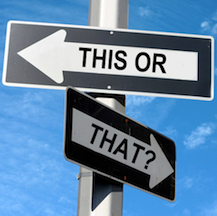 We tend to like “this or that” distinctions because they simplify, clarify, and support decisive action. You can be this, or you can be that. You can do this, or you can do that. Either this will happen, or that will happen. The problem is that the more one examines these binary oppositions, the more they tend to dissolve into a murky indeterminacy. Are you my enemy or my friend? Are you a man or a woman? Was Popeye right when he said “I yam what I yam,” or was William Wordsworth right when he argued that the soul of human nature is change and development, “something evermore about to be”? The nature of complexity is that “this or that” falls apart, becoming “both and neither” until we reach the brink of meaninglessness, when a new compensatory “this or that” usually arises to (temporarily) quiet our restless sense making for a time. This last tension, between the idea that adults really don’t change and the idea that adults change all the time, is one of the issues being explored right now through an academic debate about the relative merits of “authenticity” and “sincerity.” The contending positions are staked out in the articles below (thanks to Ross Tisnovsky for sharing them with me). The implications for leadership and management are large.